Crunch crunch CRUNCH! The collapse of the ice crusted snow punctuates our every step in the otherwise-silent forested hillside on a bright January day. Keith is hunting for perfect ash on his property (“North side! 1,200-1,600 feet above sea level~ 8 to 10 grain lines per inch.”). I’m his helper bee again. Over the years a few of Keith’s friends have spent a long weekend helping Keith process wood for upcoming years. It would be stored on ‘stickers’ to dry in his uncle’s barn nearby. We were often guests of Keith’s generous brother Brian and his wife Anne who run the Soaring Eagle Campground there on the bank of the Delaware River. But Keith was an infamous snorer- awesomely so- and we tried to insulate him from the general public so sometimes we would stay at a nearby hunter’s cabin that Keith had access to- which looked a lot more like an optimal drinking cabin. Sooo…. we had tested that out the night before and right now… our feet seemed mighty loud. Keith liked that slow growing ash that had to reach for the sky when it was young so it didn’t bother shooting out branches much. In fact we were competing with the baseball bat and veneer wood buyers in that area when we went out shopping for logs. The wood was that select. We stomp up a steep hill and then around the corner a bit and Keith pauses- target acquired. It’s a 15” northern White Ash just the way he likes them. Three saw logs on the stump. But- it’s in real tight territory and there’s only a small gap to drop the tree into. And the winds are picking up and changing direction and it’ll be getting dark soon. So it was go time. Keith made his wedge cut and just as he was finishing the cut on the back side the wind changed direction and was forcing the tree to fall the opposite way. Oh no! Is this another “Backlund story” forming up? Could be lots of damage ensuing! We elected to retreat and come back the next day when we had more time. The next morning we found the wind had dropped the tree exactly where Keith had wanted it- by changing direction one more time. So- it was all good. 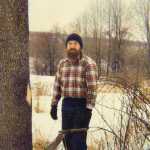 Keith would direct the sawyers on how he preferred each board cut- to get the maximum yield of wood with the proper grain alignment in the board. 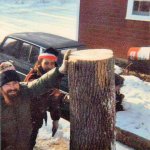 And then we would process the wood in Brian’s garage- which was also a bit of a gathering place as he kept the fire in the stove going pretty good and there was beer in the fridge. And every now and then he’d cook some venison sirloins up with butter in the cast iron skillet on the woodstove~ nom! And so we would cut the bark off with a draw knife, saw off unwanted parts of boards, and paint the ends with glue to keep them from ‘checking’ as they dry. Then on to his uncle’s barn- all stickered up in a neat stack. Keith would go over every board and label them for use later. Very few boards got the “NW” (for New World- his top of the line paddles) and fewer yet – his ‘Signature’ stash- only for him. 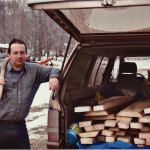 He always saved the best wood for himself but I think late in his career he did sell one or two paddles from that stash. And after a few days- we would drive home 6 hours to our respective shops with a load of wood. It was kind of like a shopping vacation- but a lot of work and a little bit of drinking. That’s pretty much how the selection process went. It was always fun to spend time with my mentor and endure his ‘pun’ishment and song singing. An unabashed humorist. I now have all the wood I’ll need for the rest of my career so I kind of miss that step.